A super addictive peanut butter dressing. Vegetarian, vegan, healthy, paleo, clean eating. Put the tofu into a small bowl with 2 teaspoons soy sauce and let the tofu marinate for 15 minutes or longer. 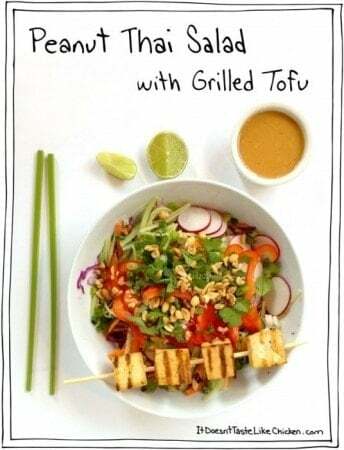 Once marinated, grill the tofu. I do this in a grill pan, but you could do it on a BBQ, or if you don't have access to either, heat a bit of oil in a frying pan and fry for a couple minutes on each side, until golden and crispy. Layer all the veggies into the bowl, cabbage, carrot, cucumber, radishes, red pepper, scallions, cilantro, and peanuts. Top with the grilled tofu. Make the peanut dressing by mixing all of the dressing ingredients together in a small bowl. Dress the salad to taste.